Hotel Description: We choose a nice hotel in Cusco that has all the amenities you need at, a good price and it is located 10 minutes walking distance to our school and to the Plaza de Armas. 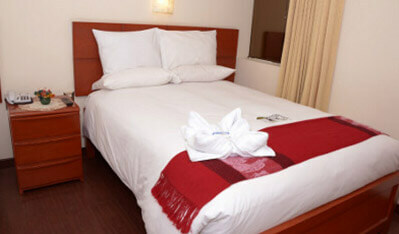 All rooms have private bathroom, with really good hot water in the sink and shower, some of them with Jacuzzi. Rooms also have cable flat screen TV, good beds with new mattress, wardrobe, wi-fi internet, telephone, and European heater. We offer Spanish and Quechua classes, being the best option to learn those languages here in Cusco, to see our classes click here. In our school we perform activities such as cooking lessons, salsa lessons, games and many more activities. We also offer tourist packages to visit tourist attractions of Cusco, to see our packages click here.